First launch of Space Shuttle Columbia during STS-1. Columbia disintegrated upon reentry this day in 2003, killing all seven crew members. 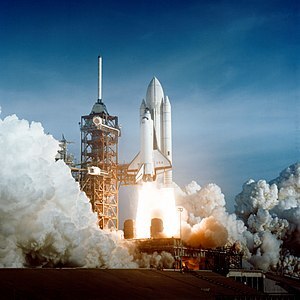 English : First launch of Space Shuttle Columbia during STS-1. Columbia disintegrated upon reentry this day in 2003, killing all seven crew members. Electrolytically refined pure (99.9 %) nickel nodules, and a high purity (99.99 % = 4N) 1 cm3 nickel cube for comparison. Crystallized nickel-electrolyte salts (green) can be seen in the pores of the nodules. English : Electrolytically refined pure (99.9 %) nickel nodules, and a high purity (99.99 % = 4N) 1 cm3 nickel cube for comparison. Crystallized nickel-electrolyte salts (green) can be seen in the pores of the nodules. Wartime hiding place "Nabessaar" (Nabe island), Lohusalu village, Northwestern Estonia. English : Wartime hiding place "Nabessaar" (Nabe island), Lohusalu village, Northwestern Estonia. A SCAC/Alenia Aermacchi Sukhoi Superjet 100 (RA-97004) flying off the coast of Italy near Sanremo. English : A SCAC/Alenia Aermacchi Sukhoi Superjet 100 (RA-97004) flying off the coast of Italy near Sanremo. English : Video of spores being ejected by fungus. English : On Victory Day King George VI and Queen Elizabeth, accompanied by Prime Minister Winston Churchill, appeared on the balcony of the Buckingham Palace before the cheering crowds. English : Berlin Television Tower. English : The implosion of Radio Network House on 5 August 2012 was New Zealand's first ever controlled building demolition by explosives. Typical view of Joshua Tree National Park with impressive rocks and Joshua trees (Yucca brevifolia). The photo is taken from the parking lot close to the Banana Cracks Formation. English : Typical view of Joshua Tree National Park with impressive rocks and Joshua trees (Yucca brevifolia). The photo is taken from the parking lot close to the Banana Cracks Formation. Skyline at night of Toronto, Canada. English : Skyline at night of Toronto, Canada. English : A periodic cell of argon was simulated using Metropolis Monte Carlo translational moves, sampling the canonical ensemble at 98 K. Argon-argon interactions were represented using a Lennard-Jones potential. English : Cassini has been snapping visible-light photographs of Saturn's rings, the Composite Infra-red Spectrometer instrument was taking the rings' temperatures. During equinox, the rings cooled to the lowest temperature ever recorded. The A ring dropped down to a frosty 43 Kelvin. Studying ring temperatures at equinox will help scientists better understand the sizes and other characteristics of the ring particles. Facade of Saint Peter's Basilica in Rome (Italy), beginning of the evening. Vatican City. English : Facade of Saint Peter's Basilica in Rome (Italy), beginning of the evening. Vatican City. English : Calcium imaging of a zebrafish embryo (time-lapse). Actual time frame, 5 min. A Cordwainer making shoes in Capri, Italy. English : A Cordwainer making shoes in Capri, Italy. English : Gun camera footage of the airstrike of 12 July 2007 in Baghdad, showing the slaying of Namir Noor-Eldeen and a dozen other civilians by an US helicopter. English : Jimmy Wales answers the question about internet censorship in China (from Shujen Chang) at Wikimania 2012 opening ceremony. Building in Ljungris, Ljungdalen, Berg Municipality, Jämtland County. Ljungris is owned by the Sámi community and used especially for Reindeer calf marking in the summer. 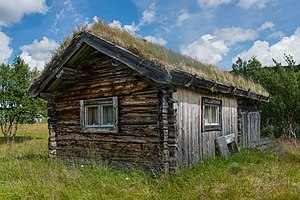 English : Building in Ljungris, Ljungdalen, Berg Municipality, Jämtland County. Ljungris is owned by the Sámi community and used especially for Reindeer calf marking in the summer. English : Meteorite shower over Chelyabinsk on February 15, 2013. English : Sunrise in Viru bog at Lahemaa National Park. Tycho crater's central peak complex casts a long, dark shadow near local sunrise in this spectacular lunar-scape. English : Tycho crater's central peak complex casts a long, dark shadow near local sunrise in this spectacular lunar-scape. A Burrowing Owl near Goiânia, Goiás, Brazil. It is standing on one leg. English : A Burrowing Owl near Goiânia, Goiás, Brazil. It is standing on one leg. English : The Little Princess is a 1939 American drama film directed by Walter Lang. The film was the first Shirley Temple movie to be filmed completely in Technicolor. It was also her last major success as a child star. Shirley Temple died on February 10, 2014. Early morning in Endla Nature Reserve. English : Early morning in Endla Nature Reserve. Sant'Angelo Bridge over the Tiber River with the St. Peter's Basilica in the background from the Umberto I Bridge. English : Sant'Angelo Bridge over the Tiber River with the St. Peter's Basilica in the background from the Umberto I Bridge. English : Film footage of Tolstoy's 80th birthday at Yasnaya Polyana. Footage shows his wife Sofya (picking flowers in the garden), daughter Aleksandra (sitting in the carriage in the white blouse), his aide and confidante, V. Chertkov (bald man with the beard and mustache) and students. Filmed by Aleksandr Osipovich Drankov, 1908. NGC 4565 is an edge-on spiral galaxy about 30 to 50 million light-years away in the constellation Coma Berenices. English : NGC 4565 is an edge-on spiral galaxy about 30 to 50 million light-years away in the constellation Coma Berenices. English : This video explains what Linked Open Data is, how it works and how it can serve memory organizations like galleries, libraries, archives or museums. A Blue-crested lizard (Calotes mystaceus) in Keibul Lamjao National Park, Bishnupur district, Manipur, India. English : A Blue-crested lizard (Calotes mystaceus) in Keibul Lamjao National Park, Bishnupur district, Manipur, India. SEM image of Tradescantia pollen and stamens from Tallinn University of Technology. English : SEM image of Tradescantia pollen and stamens from Tallinn University of Technology. English : Neal O'Doan and the Soni_Ventorum play the Mozart Quintet in Eb Major for piano, oboe, clarinet, horn and bassoon (movment 2, Larghetto). Basilica of Our Lady of the Rosary of Chiquinquirá (Venezuela) Exterior. English : Basilica of Our Lady of the Rosary of Chiquinquirá (Venezuela) Exterior. English : Skyline of Frankfurt, Germany as seen from the Deutschherrnbridge (Deutschherrnbrücke). A RhB Ge 4/4 II with a push–pull train crosses the Wiesen Viaduct between Wiesen and Filisur, Switzerland. English : A RhB Ge 4/4 II with a push–pull train crosses the Wiesen Viaduct between Wiesen and Filisur, Switzerland. English : Atmosphere on Maidan Nezalezhnosti in Kiev, when Berkut was coming and starting an "anti-terrorist operation". In the following hours about 80 people died here. English : On July 19, 2013, in an event celebrated the world over, NASA's Cassini spacecraft slipped into Saturn's shadow and turned to image the planet, seven of its moons, its inner rings -- and, in the background, our home planet, Earth. English : Latticed Heath (Chiasmia clathrata) in the vegetation of wasteland. Taken near Marburg, Germany. English : Adria Airways A319 night landing and takeoff at Frankfurt Airport and landing at Ljubljana Jože Pučnik Airport seen from cockpit.